“Lord, teach us to pray.” – Luke 11:1. Prayer was an important part of Jesus' life and ministry. Jesus knew, and wants us to know, that prayer is mightier than the sword, and has the ability to slay the enemies of the soul. Prayer is brighter than the rays of the sun, revealing the hidden depths of the human spirit. Prayer is quicker and stronger than eagles’ wings, bearing us up from the confines of the earth and transporting us to the throne room of God. 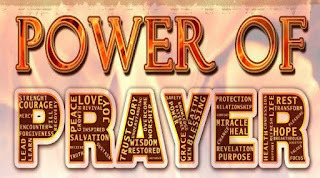 Prayer is a greater power in the transformation of the world than all legislation and military might. The center of its power is in the heart which utters it; the radius of its influence is as infinite as the mind of the Living God. It is the cool breath that comes to ease the fevered brow. It is the Holy lever of Archimedes to move the world! How is your prayer life my friend? Also, let us know if we can help or pray for you!